South Korea's triple-A celebrities Song Joong-ki and Song Hye-kyo, who co-starred in the smash-hit KBS TV drama "Descendants of the Sun" in 2016, tied the knot at The Shilla Seoul on Tuesday. The groom, 32, and the bride, 35, held a private wedding in the banquet annex Yeong Bin Gwan at the hotel in Jung-gu. There was tight security as dozens of security guards stood at the entrance and the hotel took measures so the inside of the wedding venue could not be seen. The stars' agencies did not hold any press conference or photo session, but provided photos after the ceremony. Actor Cha Tae-hyun, who is known as Song Joong-ki's lifetime mentor, Jo Jae-yoon, Ma Dong-seok, attended the wedding. Korean singer and musical actress Ock Joo-hyun sang at the wedding, while actor Yoo Ah-in and Lee Kwang-soo read a congratulatory letter. Actor Park Bo-gum, who is with the same agency as Song Joong-ki, played the piano. 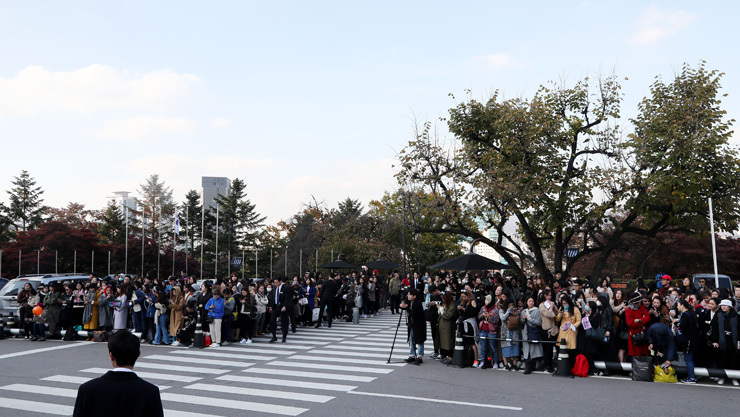 Many foreign fans stood outside for two hours before the wedding with placards saying "Ki heart Ky," and "Song Joong-ki, Song Hye-gyo I love you" in Korean. "All rooms with a city view at The Shilla Hotel are booked, it is difficult to tell if the rooms were reserved by fans, but it seems so," said a hotel employee. Chinese actress Zhang Ziyi, Song Hye-kyo's close friend, and Korean actresses Kim Hee-sun, Kim Ji-won, Park Bo-young and Song Yoon-ah also attended the so-called "wedding of the century." The newlyweds, known as the "Song-Song couple," invited around 300 guests. Guests also included directors, writers and staff of the TV drama. The couple's romance developed while filming the war drama based in a fictitious country. The couple will honeymoon in Europe and settle in a house the actor bought in the Itaewon district in Yongsan-gu, Seoul, in January.